Here is a new website offering tons of information and insights for those who want to travel to Iran. It provides Iran’s travel destinations, Iranian cuisines and lots of other useful content. Soon VisitoIran will be offering exciting tour packages as well. How to Tell if You’re a Writer? For John Irving, the need for a daily ration of solitude was his strongest “pre-writing” moment as a child. So he discovered a difference, or a need to entertain! Anne Rice share some of her personal insights into writing. Every day, the New York Times carries a motto in a box on its front page. “All the News That’s Fit to Print,” it says. It’s been saying it for decades, day in and day out. I imagine most readers of the canonical sheet have long ceased to notice this bannered and flaunted symbol of its mental furniture. I myself check every day to make sure that the bright, smug, pompous, idiotic claim is still there. Then I check to make sure that it still irritates me. If I can still exclaim, under my breath, why do they insult me and what do they take me for and what the hell is it supposed to mean unless it’s as obviously complacent and conceited and censorious as it seems to be, then at least I know I still have a pulse. You may wish to choose a more rigorous mental workout but I credit this daily infusion of annoyance with extending my lifespan. Incubators and accelerators help entrepreneurs refine their business ideas and offer support to promote growth. Given the pace of change that lessens the go-to-market timeline, incubators and accelerators can be helpful environments for entrepreneurs to take their start-ups to the next level. Join us at the next event in the startupPerColator Series, “Incubators and Accelerators – The Inside Secrets,” to learn how to find incubators and accelerators, the benefits they provide, the costs, and ultimately, whether it’s the right decision for you. Complimentary breakfast to be provided. Blue Ocean Strategy ( BOS ) is one of the most interesting business & management strategies I’ve learnt so far. It’s highly related on innovation and the spirit of Blue Ocean Strategy is very much similar and related to Entrepreneurship. Knowing BOS is indeed eye-opening for entrepreneurs. The Idea of Blue Ocean Strategy & the FOUR technology is freshly presented in a 30 minutes presentation and I’m pleased to share some of the slides with you via the following Slideshare link. Please do not hesitate to share your comments & ideas with me. What’s the real Google agenda? 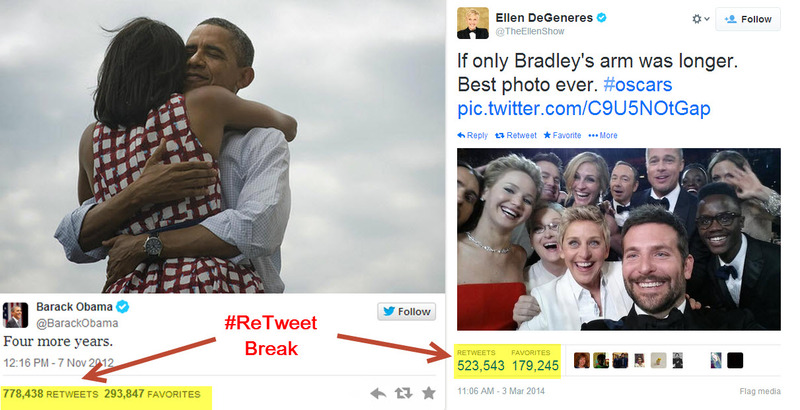 The Ellen Degeneres’s Tweet becomes the worlds most retweeted tweet and most retweeted photo. with more than one million tweet in less than one hour and more than 2 million retweet in less than 3 hours. I published this photo right after Ellen’s Tweet, It was obvious that this tweet is going Viral like no other tweet has been retweeted before! Before the Ellen’s record breaking tweet Barack Obamas Famous tweet after winning the second round of presidency was the most retweeted tweet by more than 780000 retweets. Lea Michele’s Tweet after death of her co-star and boy friend was the most Retweeted Tweet of 2013! Ellens Oscar’s Selfie Tweet Will Reach about 4 Million Retweets RT in Less than 24 hours!